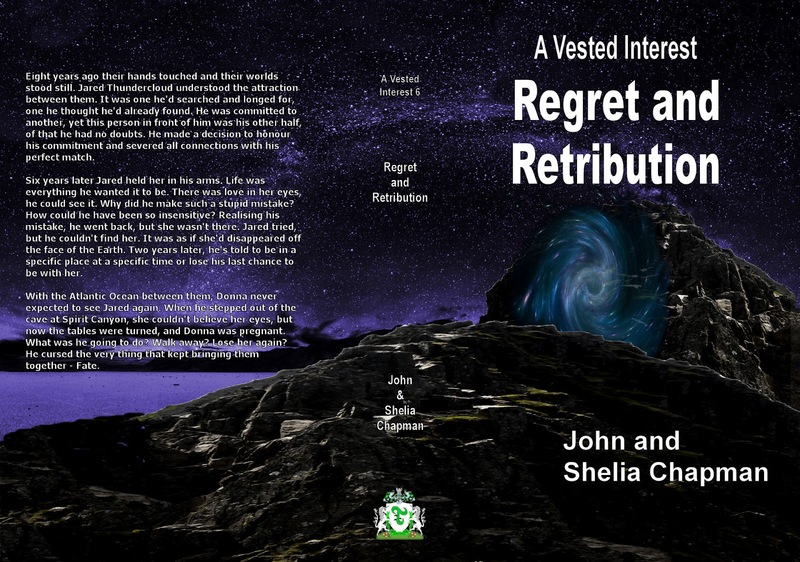 Now however E-books have made it possible for many new authors to publish work that would otherwise end in agents and publisher’s slush piles. You can test the water by releasing your book as an e-book, publicize it yourself (For how to do that read John Locke’s excellent book ‘How I Sold 1 Million… ‘) and then, if there’s a demand, produce a paper copy. I wrote an e-book on the process of producing both the paper copy and the e-book version. You can either buy it at Amazon or get it free here. Somewhere along the line though you’ll need a book cover and there the advice stops. Granted there are websites which offer template solutions but most of them leave a lot to be desired and frankly – a book is judged by it’s cover. 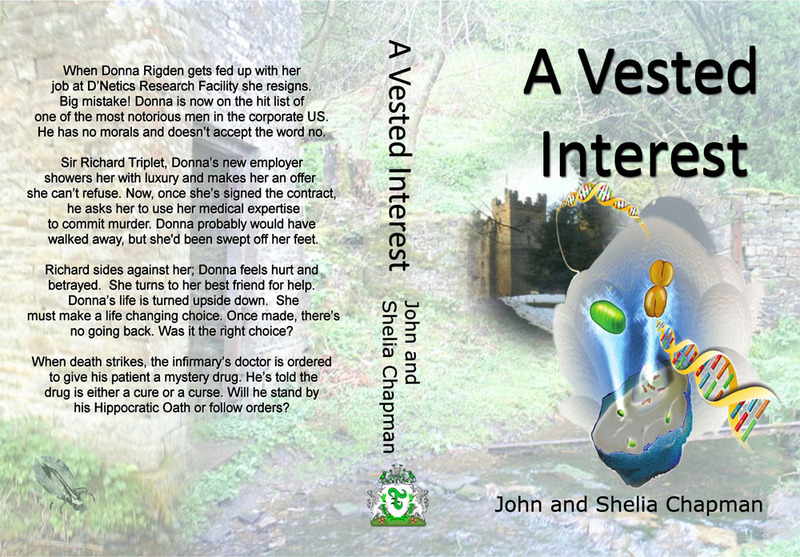 We’ve written and published five books so far in our A Vested Interest series and in the hope that our experience will help, here’s what was involved in designing the covers. In a future blog post I’ll cover the technical side of creating the covers. The plot of this book involved an unpleasant secret buried in the family for almost a thousand years. The secret was revealed in an old diary. 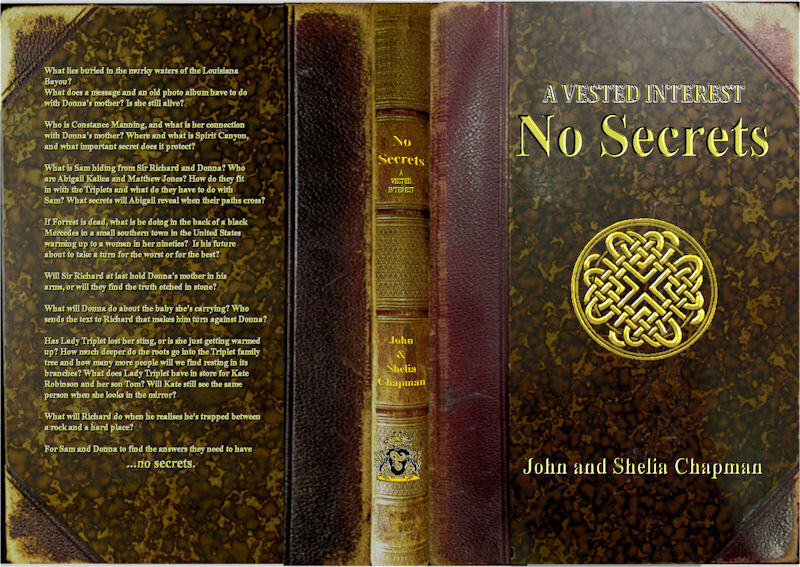 To reflect this we created a cover looking like an old book and featuring the coat of arms of the Triplet family. The old book was to be dark colored to reflect the title but when we got the first proof back from the publishers it was almost black. The final version was a lot lighter. For the old book I scanned an old copy I have of Uncle Tom’s Cabin and then removed the text. With the aid of my son Adam we created a ‘coat of arms’ and then turned it and the book cover text gold. On this one we didn’t put the coat of arms on the spine since it was already on the front cover and the spine is much narrower. 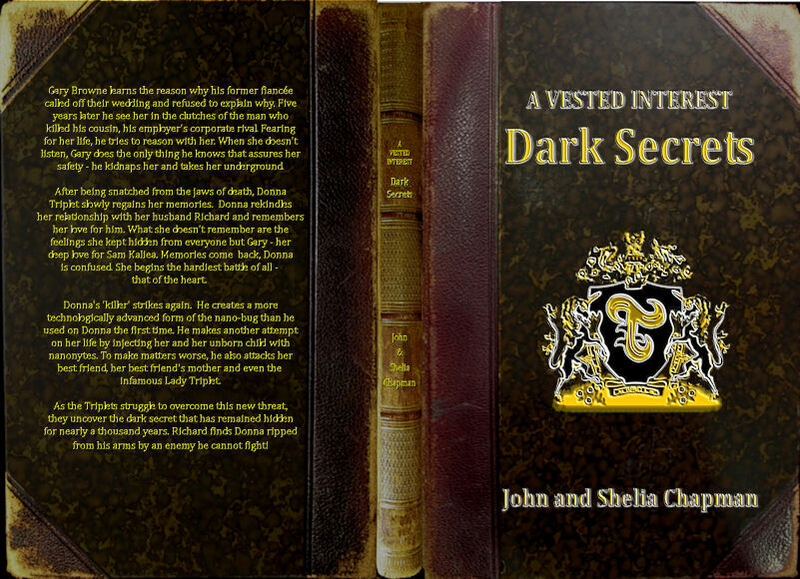 No Secrets was very much a continuation of Dark Secrets so we decided to use the same layout. Obviously we couldn’t use the same image on the front so chose a Celtic knot instead, symbolizing eternity. Of all the covers it’s the one we are least happy with and it may change. In this book the Triplets travel the world visiting pyramids and other locations while following clues left in an ancient document. One of the locations is Death Valley, another is the Mayan pyramid at Chichen Itza, Mexico. We started with a black and white picture of Death Valley which we colored dark blue. To that we added the pyramid viewed through a ‘window’ on the front cover and framed in vegetation from the jungle in Mexico. On the back we added our idea of the power mechanism revealed at the end of the book. People liked this cover so much they asked if they could use it as a screen background. We obliged with a version without the text, coat of arms or vegetation. Find it here. 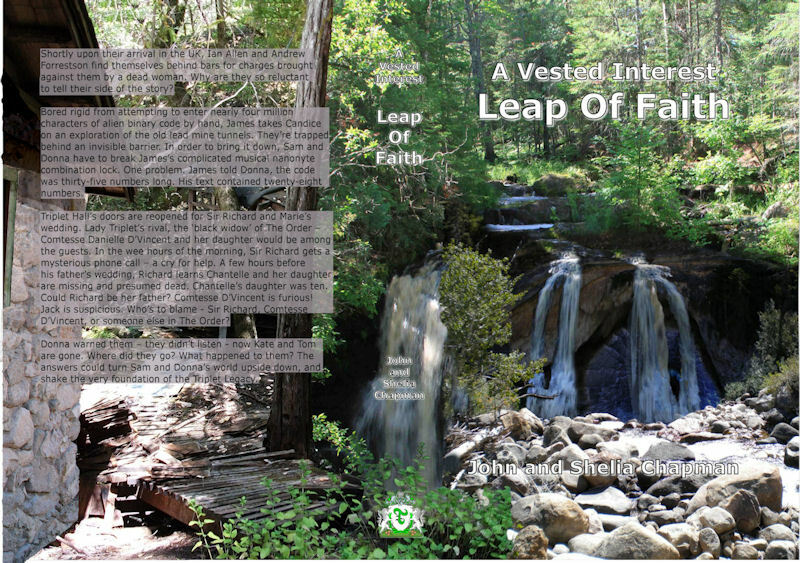 In this book there’s a location Spirit Canyon in Arkansas. 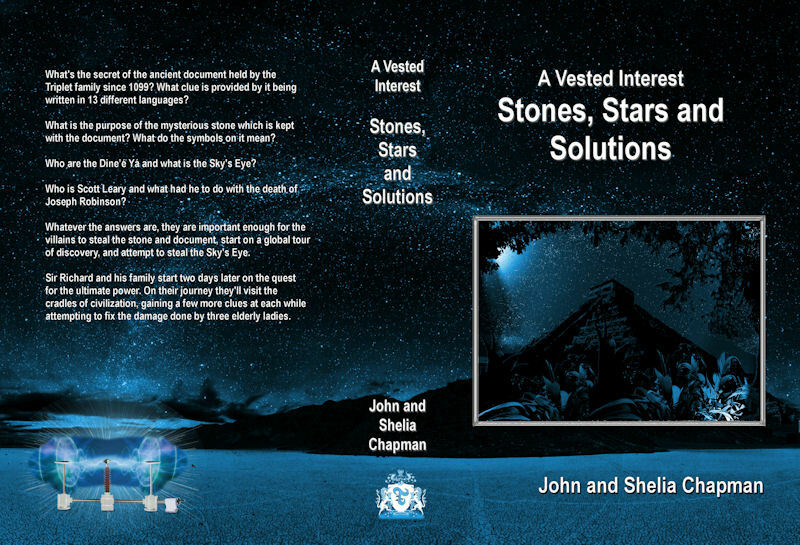 It was one of the places mentioned in Stones, Stars and Solutions and also appeared in No Secrets. 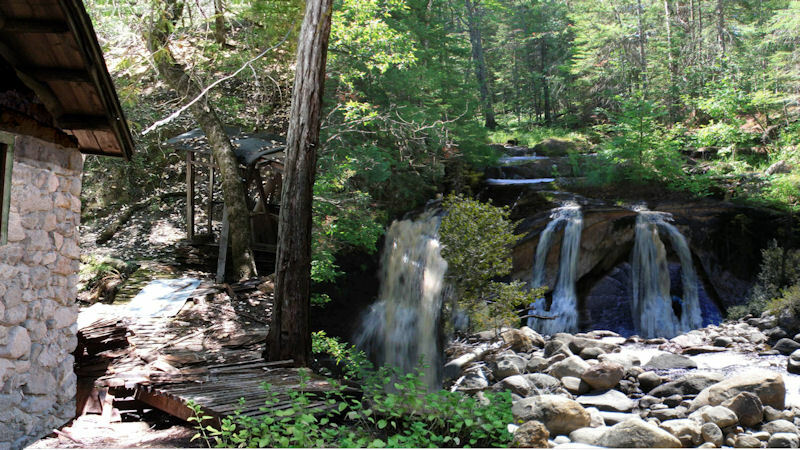 Spirit Canyon features a stone cabin which you can only get to through a cave and a waterfall. We wanted to show this place on the cover. The problem is that though we know it’s location, the actual place doesn’t exist so we had to make it with bits and pieces of other pictures. For a book cover you need high resolution pictures because the file you send to a printer is 5,700 by 3,900 pixels in size although the image I need is 3,510 by 2470 pixels. I start with a template document from the printer. It’s actual size depends on the size and thickness of the book. If you use CreateSpace as your publisher this template is worked out for you when you upload the book contents. It can be a little difficult to find but it’s there. Now this picture is a little busy for a book cover and it’s not perfect. I chose to add text with a semi transparent background to hide the imperfections. Making a cover like this isn’t hard. You just need a computer with lots of memory and a decent painting application which can use layers, masks, feathering and bézier text. The industry standard program is PhotoShop, but there are others such as Corel PaintShop Pro or The Gimp which can do the job and are much less expensive. There are lots of tutorials available on the web explaining exactly how to merge images so I don’t plan on explaining this here. I’m still not happy with the front and spine text on the cover since although it’s fine on a printed book it fails to stand out in the smaller versions used for e-books and at Amazon. The spine text could be made clearer by turning it through 90 degrees but I, for one, hate having to turn my head sideways to read the text on book spines. I’m also a little dubious of the base of the stone cabin which doesn’t quite fit on the ground correctly. I probably need to add some weeds here to cover the join. What’s wrong with this cover? The author names are too small. At Amazon’s thumbnail size they are unreadable. 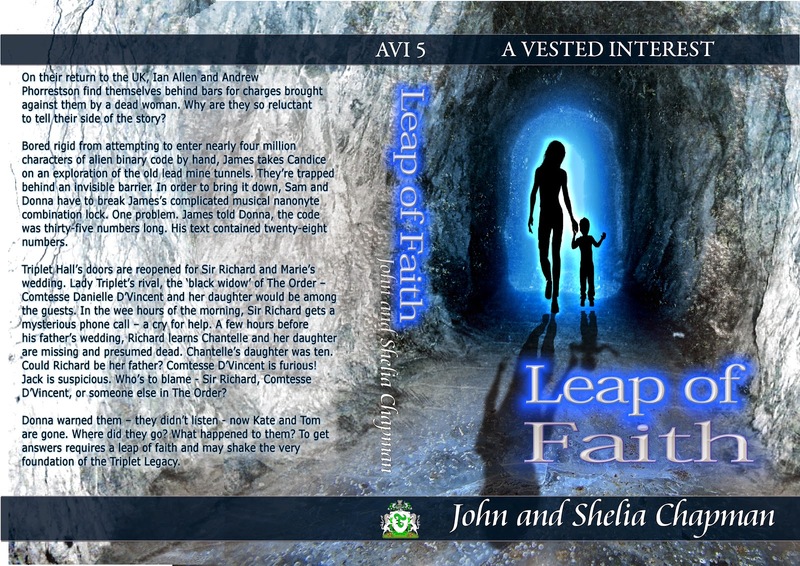 The cover shows the moment when Kate and her five year old son Tom take the ‘Leap of Faith’ from which the book get’s its name. Now tell me, what emotion do you think Tom is feeling? 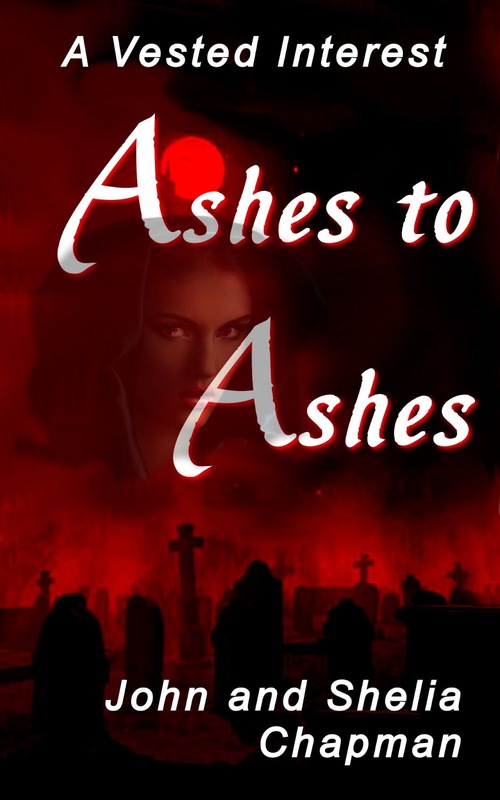 Here’s our most recent book cover for ‘Ashes to Ashes‘. 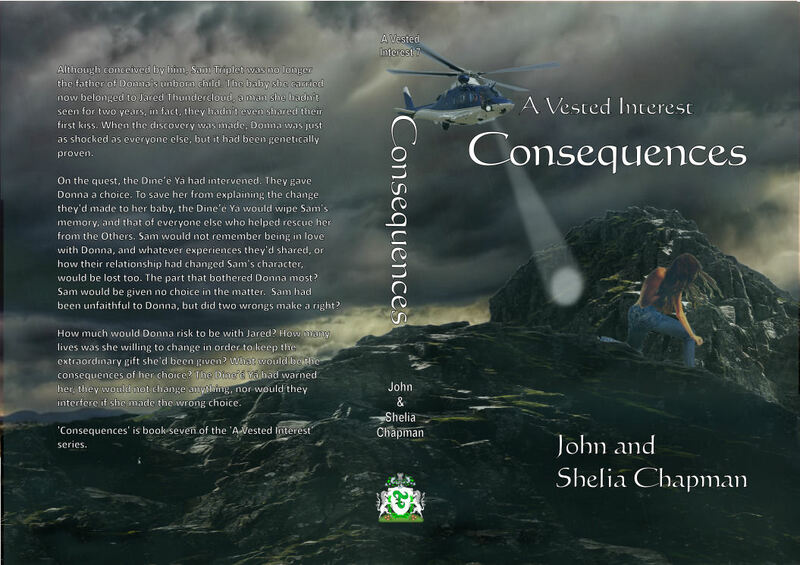 We start this book with the aftermath of an alien possessed woman running wild in the mine complex. Death plays a big part in this book at it’s beginning and that is reflected in it’s cover. 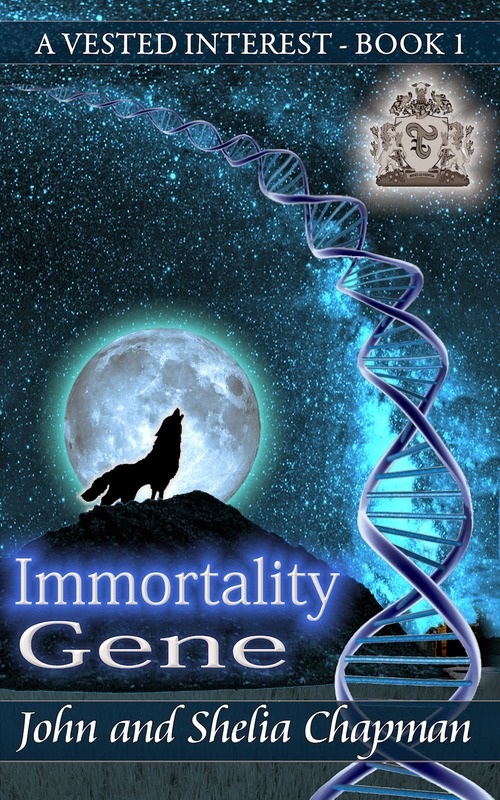 I think, with practice I’m getting better at doing these covers and this one is very effective both on a paper book and as an ebook, even when shown as a tiny thumbnail. What do you think?